“There is a way to be sane. I'm saying that you can get rid of all this insanity created by the past in you. Just by being a simple witness of your thought processes. It is simply sitting silently, witnessing the thoughts, passing before you. Just witnessing, not interfering, not even judging, because the moment you judge you have lost the pure witness. The moment you say “this is good, this is bad,” you have already jumped onto the thought process. It takes a little time to create a gap between the witness and the mind. Once the gap is there, you are in for a great surprise, that you are not the mind, that you are the witness, a watcher. And this process of watching is alchemy. Because as you become more and more deeply rooted in witnessing, thoughts start disappearing. You [exist], but the mind is utterly empty. Frequent floater and featured Total Zen artist Jon-Michael Birt is offering an amazing deal to the first five people that buy a canvas from him each month: a free one-hour float at Total Zen. If you've been to Total Zen, you've no doubt seen some of Jon-Michael's work. His intent is to induce a state of mind in the viewer that allows them to travel deeper into themselves to discover the Source within that connects all life on Earth. "This painting is my interpretation of what the flower of life means to me. In that when you observe existence with the knowledge of the flower of life you see that there are multiple layers of reality, and your perspective defines what you see more so than what exists." "This painting was inspired by my troubles with my heart. The green landscape represents my heart black with weight from guilt. The golden Self sitting in meditation awaiting the white light healing, represented by the comet headed toward the landscape." "The inspiration for this one was the oneness of creation. The separation into color from the pure white light makes up all that we experience in this realm. This is not to be interpreted as an illusion but as a gift. To experience the beautiful magnificence that is creation. The center point of the Sri Yantra is colored green to represent love and the heart of creation." "The pure white sri yantra representing creation. The multidimensional Merkaba is placed on top so that you can see that it's shape exists in the Sri Yantra and also to represent it's use as a vehicle for multidimensional travel and energy expansion. The meditating man beginning to fractal out into stars as he witnesses the ancient wisdom of the Merkaba." "Two ancient symbols of ascension combined into one.First is the Mayan galactic butterfly then the Sri Yantra. The combination of the two is intended to be used as an energy/meditation enhancer." "This painting also takes two symbols of ascension and combines them as a tool for energy/meditation enhancement. Depicted is the Mayan galactic butterfly and the merkaba." As you can see from above, Jon-Michael combines ancient symbols of sacred geometry, like the Sri Yantra and Merkaba, with modern techniques to produce mind-blowing transcendental art. And because of his passion for helping people connect to the deep Source within, Jon-Michael wants his works to be easily accessible. Although his paintings could easily sell for thousands of dollars, Jon-Michael simply asks for $100 per canvas. If purchasers are able and willing to give more, he will accept it as a gift; still, he appreciates any sale, large or small. And now, for a limited time, he is also giving away a one-hour float ($45 value) with each of the first five paintings he sells each month. What an amazing deal. What an amazing and talented human. We feel blessed at Total Zen to collaborate with Jon-Michael. If you are interested in a painting or seeing more of his works, check him out on Facebook or contact Total Zen. These new paintings and the other works of Jon-Michael Birt on display at Total Zen feature sacred sri yantras and other sacred geometric symbols. Sacred geometry can be a means of accessing the Infinite and it is known to have a powerful effect on the mind. Jon-Micheal also offers sacred artwork via his Mayan astrology readings, hand-dyed clothing. which he offers to clients along with a painting which depicts the reading in symbolic form. Total Zen will be hosting Dr. Randall Roffe, an amazing teacher with lots of street cred (see below), who will be teaching a 12-week course in Herbal Medicine. This class will occur right here at Total Zen on Sunday afternoons from 1:00-2:30 pm starting June 29, 2014. Dr. Roffe worked directly with John C. Lily, the Godfather of Float tank therapy. He also was a student of Yeshe Donden, who was the Dalai Lama's personal physician. In fact, Dr. Roffe also studied with the Dalai Lama. That's right. The Dal-ai Lama. So he's got that going for him, which is nice. Dr. Roffe has trained in Okinawan and other Oriental traditions of herbal medicine since 1967. He is well-versed in Ayurveda, the Indian science of life, and is the founder of the Kvniakati Tsulawi School of Herbal Medicine and Kvnia Botanicals, the manufacturer of over 120 herbal products. He is a licensed chiropractor, and a state-certified teacher. The bottom-line is that he is pretty much a badass, and we are super stoked to have this opportunity to learn from a Master directly. The class will focus on herbal medicine, and will include local exploratory nature field trips. In addition to learning about herbs, class participants will learn about the 12 moons, meridians, organ systems, and functions, as well as the Medicine Animal associated with each. Classes will cost $20 each, or $10 each for Float Club members. A discount is offered if the workshop is paid in full prior to the first class: $200 to general public or $100 for Float Club members. Participants will receive a certification from the Kvniakati Trulawi School upon completion of the course. What an amazing opportunity that you will not want to miss! Contact Total Zen for more info or call (407) 960-4155 to register. What is PechaKucha and what does it have to do with sensory deprivation floating? These are great questions, which will be answered in this very article. PechaKucha is a fast-paced method of speaking and presenting designed to keep the audience entertained and captivated. Each speaker presents 20 PowerPoint slides for 20 seconds a slide. The method of speaking was created in Japan by a couple of architects who wanted to invite creative folks to speak but not to drone on and on. The format doesn't allow for long boring talks. And this year, one of our Total Zen's customers will be talking about sensory deprivation floating at PechaKucha. There will be eight other speakers and it is sure to be a great night. The event is scheduled for June 13th at 8:00 p.m. Check out the PechaKucha website or Facebook page for more information. We've already posted a couple articles on the topic of floating. First we offered some general floating tips for beginners with our "Floating Tips" article. Then we made some suggestions for our more seasoned floaters in our "Advanced Floating Tips" post. So now that you are all caught up on what to do while floating, perhaps you've wondered what to do AFTER you float? Wonder no more, because we have some suggestions. Floating is known to stimulate the creative centers in the brain. In fact, Float H.Q. in Portland decided to offer 150 local artists two free floats with the understanding that the artist would produce a piece after the second float. The results were so amazing that they published a book with the art and stories of the artists called "Artwork from the Void." Of course, there are lots of other ways to "decompress" after floating and to try and integrate the experience in your brain. You could try journaling. There is a journal available at Total Zen if you would like to sit in our waiting room and write after floating. Also, some floaters enjoy playing music just after a float. Or, you might find you want to just sit in silence. Yoga exercises are also recommended as they help to unite mind and body. We'd love to hear about your post-float experiences! Please feel free to use the comments below! Have you heard about all the media attention Total Zen Float has been getting recently? Derek and Will from Total Zen Float with "The Sports Clique"
Derek from Total Zen on "The Sports Clique"
We are kind of a big deal. Total Zen is proud to offer Onnit supplements to its customers. Curious about the supplements on display at Total Zen? Look no further! These supplements appeal to floaters and other mind/body pioneers who are looking to optimize their mental and physical potential. "Onnit is a brand dedicated to creating products to help people achieve their maximum potential. We have drawn a line in the sand, and excellence is our guiding star. We are 100% committed to earth-grown nutrients, honest and transparent business, and stunningly effective supplements, foods and fitness." Alpha Brain - designed to increase mental focus. It contains nutrients that "help your body turn up acetylcholine levels full throttle" and elevate "neurological components vital to remaining calm, focused, and mentally driven." Joe Rogan (Comedian, actor, avid floater) says of Alpha Brain, "It seems to fire up your brain at a higher RPM level...I feel like it helps me form sentences better." This writer had a similar experience using Alpha Brain. The difference after taking it is subtle but profound. The type of thing where you look back severfal hours after taking it and think, "did I accomplish all that today? Shroom Tech sport- designed to be a safe, energy enhancer for real athletes that can be used daily. It has a combination of Cordyceps mushroom, antioxidants and B-12. It helps with fatigue by providing non-stimulant based energy at the cellular level, and improves oxygen utilization. AJ Hawk (linebacker for Green Bay) describes the benefits of Shroom tech, "It gives me the endless energy and stamina that lasts long after I'm done. I will not leave home without it." New Mood - designed to aid the body's production of serotonin, increasing mood and promoting calmness. It contains the two raw sources of serotonin and a converting catalyst, B6, along with magnesium for muscle relaxation and D3 for mood enhancement. It is ideal for daily use and is especially helpful when you are under stress, anxiety or experiencing exhaustion. Hemp Force protein - protein powder available in ChocoMaka or Vanilla-Acai. Hemp force is made from organic hemp seeds, one of the most nutritious sources of protein in the plant kingdom. Hemp seeds contain all of the essential amino acids, all three branched-chain amino acids, and Omega-3 and Omega-6 fatty acids. 180 - a drink mix that combines Alpha Brain, Shroom Tech sport and New Mood formulated to provide cognitive support, reduce stress, and enhance energy, mood and immune function. It is particularly helpful to take when recovering from jet lag or a hangover. Aubrey Miller, founder of Onnit, sees life on Earth as a journey and writes about it on his "Warrior-Poet" website. His philosophy of life is apparent in his high-quality supplements. You might find they are a valuable tool on your own journey on Earth. We'd love to hear about it - please comment! All of the Onnit supplements are available for purchase at Total Zen, the only authorized Onnit dealer in Central Florida. The above-mentioned popular products are normally carried in stock, and everything else can be ordered. Check out the Onnit website or ask Total Zen for more information! 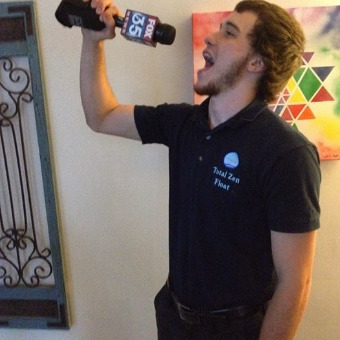 Fox 35 News in the house! The piece is set to air next month and we will keep you updated with more information. In the meantime, did you see the write-up in Orlando Magazine about us? There is a link to the article here. The concept is simply floating in a tank void of sound and light. There’s a momentary feeling of claustrophobia when the tank door shuts, but co-owner Will O’Brien encourages customers feeling confined to “envision an infinite space in the darkness.” As a warm Epsom salt solution envelops your body, you’re soon unable to distinguish where your toes end and the water begins; as the brain and body calm, relaxation sets in. Imagine feeling suspended in a gravity-deprived state, much like a womb. The skin temperature solution of water allows the body to literally float, and the mind to float away. If you haven't tried floating yet, its time! Word is clearly spreading about the benefits of floating, and all the media attention is a great sign of things to come.